What a bright and ‘chirpy’ posting 🙂 It’s so incredible to read that the 2 of you share this love. What a warm and cozy ‘hug’ to each and every day. Barb, you’re right … it’s truly special. And I don’t take it for granted. Not for a minute. Wow! I loved it when I was there, but I came home too soon. 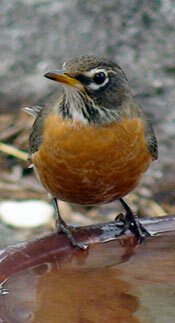 We would get the flocks of robins in Kerrville on campus. Your photos are wonderful! Loved one of Steve feeding, he is so patient and I understand why birds love him, but then we do also! 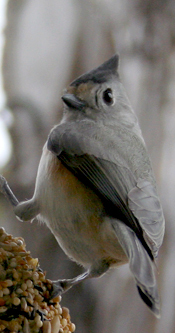 The birds have found all the suet feeders and munch a lot. Yours is really different. What kind of cornmeal do you use? Or are you adding seeds to it now? We are getting lots of birds but not the variety here. Two pairs of cardinals though so they are not so territorial now that it is cold. It is hard not to spend time watching here. I would never get anything done at your house. Judy Diehm said she is missing her birds. Beautiful pictures. It would be helpful for me, especially when there are 2 or more birds in the pictures, to tag them for me. 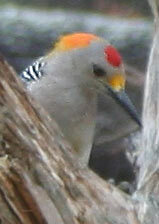 I just saw 3 birds trying to eat the suet on the pine cones, but I do not have the patience to identify them. Come on up! Your wish is my command, Dad. I tagged pics in the facebook album, at least if they had more than one type in the pic. The birds are already identified in the captions as well. Come to Michigan… hmmmm… what’s the temperature there today? Mom, the cornmeal is just “enriched yellow cornmeal” … HEB’s store brand. We’re not putting seeds into it, but we roll the pinecones in seed after covering them with suet. Thanks! the hogs here ate all the suet and we now have last of it out. I have made two batches. That is how the seed got on there. Great Idea! I have a big brown bird at suet feeders – about five of them. I am not sure what they are. I thought maybe they were female red=winged black birds but they are suppose to have white eyebrow. They are not pretty and kind of ruffed up looking. They are brown and maybe cowbird but not brown headed one. They hog the suet and fight over it. Oh, yes, our smart squirrel did get pine cone up on branch of tree. Smart little devil. One of them wasn’t out far enough to end and he got it up and laying on branch. He usually takes anything away he can get so I guess he couldn’t get it off branch. Little birds are liking the pine cones now a lot. Nothing seems to be eating fruit but woodpecker was back at suet. Temperature is very cold. Teens at night. We have had sun and warmer during day but we have all kinds of weather coming this week, so we will see.